MANY foreigners come to Bali for its unique culture and some choose to live here. The people with whom one wishes to associate are in that cohort. Some may be misguided, but that’s OK. The flowers of Eastern mysticism are as open to misinterpretation as any shamanistic bloom. Bali is a great place to have your chakras fiddled with by itinerant foreign gurus with malleable morals. It’s a sort of “Eat, Love, Prey” thing. The preying is usually mutual, or at any rate consensual. There are others, of a different class, who are here to gouge a buck and to take advantage of the brown envelope culture. Perhaps some among them occasionally reflect that they are fortunate to be in a place where they can practise their predilections, not all of them necessarily commercial, in an environment in which with the right connections you are rarely caught out. A few are possibly here because they couldn’t behave in their own societies as they can generally manage to here, or because they’d be in jail if they did. It is this latter cohort that sometimes gets up one’s nose, especially when it involves public assertions (which have no basis in fact) of the selfishly acquisitive practices of others. One particular recent incident has got up ours. Normally you’d just ignore such dog-droppings, and the dogs that drop them. But sometimes you feel that you can’t. 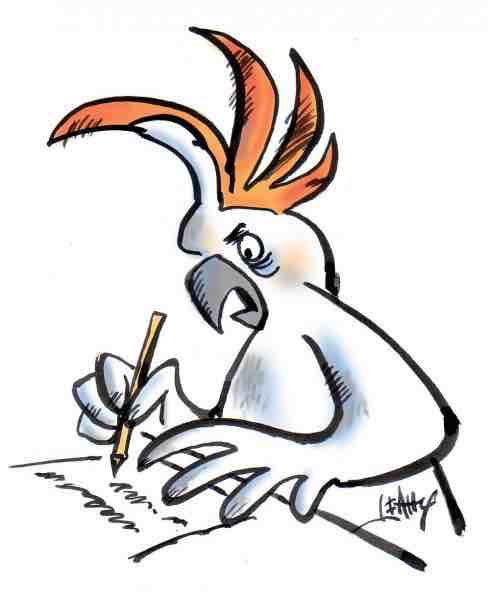 So, Terry Brockhall, formerly of Brisbane, Queensland, and presently of Dalung, Bali, this one’s for you, mate. Perhaps he was drunk or otherwise intellectually incapacitated when last week he posted (on the Bali Expats Facebook group) his intemperate, litigious and profoundly incorrect assessment of what someone who has been at the forefront of obtaining funds to assist the thousands of Balinese volcano evacuees had actually done with the money. A good rule of thumb for civilised existence is to subject your own subjectivity to rigorous analysis before you mouth off. IT’S no surprise, though one might wish it were, that the Sharia authorities in Aceh have taken to publicly stripping and whipping transsexual people whom they are sure have angered Allah. It is a surprise, in contrast, and yet another sour one, that Indonesia Air Asia announced last week that its cabin crews on services to the autonomous Neolithic province would in future be all male. 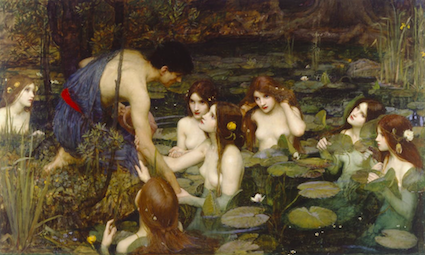 Hylas and the Nymphs, the widely known painting , by John William Waterhouse. It is one of the most recognisable of the pre-Raphaelite paintings. Postcards of the painting were taken off sale in the shop. According to the gallery’s curator of contemporary art, Clare Gannaway, the aim of the removal was not to censor but to provoke debate. Tell that to the nymphs and wait for the derisive laughter in response. The work usually hangs in a room titled In Pursuit of Beauty, which contains late 19th century paintings showing lots of female flesh. Perhaps the key to the whole horror of this act of non-censorship lies in Gannaway’s explanation – no doubt it is “feminist” by some empty-headed definition or other – that the room’s title was a bad one, as it was male artists pursuing women’s bodies, and paintings that presented the female body as a passive decorative art form or a femme fatale. Still, it’s a device that would easily fix the hefty financial call on galleries to acquire, care for, insure and display works of art. They could just put post-it notes around the walls instead. That would be much cheaper and surely would offend no one except those who like to look at paintings and who in such circumstances would naturally no longer visit museums and galleries. The great unwashed, who do not do so anyway, would neither care nor notice: Planet Doh again. The curiously disingenuous argument from the museum flows from the supposed pandemic of sexual mistreatment of minors. A mob has been raised on this matter and in the manner of such swarms is now out of control. There are perverts in any society. If those who fiddled with little boys and girls had been privately horsewhipped on discovery of their first offence, most would probably not have done it again. Madness is an illness. Perversion is an elective practice. THE Ubud Food Festival, Janet DeNeefe’s highly successful annual spin-off from the well established Ubud Writers and Readers Festival, has won star billing from ABC, the Indonesian food company that produces Indonesia’s essential condiments, kecap manis and sambal. Without these, no one’s food from his or her island home would be as piquant as it should be. According to Dhiren Amin, who is head of marketing, Southeast Asia, at Kraft Heinz ABC, popularising Indonesian cooking and the archipelago’s diverse culinary traditions is a vision ABC shares with UFF, and this was a primary motive in the company becoming a presenting partner at the 2018 festival. And DeNeefe notes: “It’s a brand we all know and love, so it’s a perfect fit for our festival.” We agree. The Diary’s finely tuned taste buds are already in full anticipatory mode. Corporate sponsorship is essential for any style of festival these days, so ABC’s move is as welcome as its spicy little bottles at the UFF table. The festival is from Apr. 13-15 this year – themed Generasi Inovasi – and will feature nearly 100 speakers, and their culinary delights. THE volcano was quiet on Sunday. Literally. For the first time in a long while, no volcanic or resultant seismic activity was noted. Inevitably, this will result in those who believe their economic and political interests lie in assumptions that all is well seeing an opportunity to promote the idea that there is no emergency. To these people, we simply say this: Study the records, such as they are, of the lengthy and occasionally quiescent eruption of Mt Agung in 1963, and do not assume anything. Go with the volcano science, not political science. SOME who read The Diary will know the name: John McKenzie Keir. He was a fine gentleman, well known in the Australian commercial aviation sector. He was also our friend of more than two decades, and we were greatly saddened to learn, today, that he had left us. He died last Tuesday, the victim, finally, of the leukaemia with which he was diagnosed twenty-two years ago. Latterly other opportunistic agents of fatality had joined the assault upon him, and he succumbed. Our association came about because his wife and our Companion worked together in the now distant past, and hit it off rather well. They were often rowdy, in a ladylike way, and maintained that practice throughout the years following, during which they occasionally saw each other and misbehaved. Mr Keir and The Diary were sometimes peripheral to these celebrations, as Significant Others are supposed to be. We last saw him on a flying visit to Brisbane in 2016 – the trip was to attend someone’s political birthday party – and saw a Lions v Swans match at the Gabba by benefit of his ALF fixation and his Lions’ membership. It was a good game on a mild Brisbane autumn afternoon and we all dined pleasantly together afterwards. We’ll miss the enigmatic smile with which he handled cross-table repartee and his sommelier-standard handling of wine bottles with recalcitrant corks. His funeral is in Brisbane tomorrow. We shall toast him at dinner tonight – we hope in the style and with the panache on which he would surely insist – with warm thoughts for his lovely family.